With our state of the art Next Generation Pre-Flex® Technology manufacturing methods and our high tech CNC (computer numeric control) equipment, we can construct a precisely engineered hull that delivers advanced performance with superior strength. Through our racing experience and successes we have developed our Next Generation Pre-Flex® Technology hull technology. These industry leading race boats only weigh 400 to 500 pounds, we install in excess of 1000 horse power and drive them to 120 mph to win races. The bottom line is: If WestWinns Harbercraft race hull built from thinner materials than our fishing boats can tolerate this severe abuse race after race, then our Kingfisher Multi-Species fishing boats, using the same Pre-Flex® Technology but in thicker aluminum sheets, will stand up to the every day abuse a recreational boat user can put it through. What is Next Generation Pre-Flex® Hull Technology? Pre-Flex® Technology incorporates the use of computer-assisted manufacturing technologies resulting in a product with the highest level of finishing accuracy in the industry. Our boat hulls are "formed" and fit together to extremely fine tolerances. The hulls start out as flat sheets of 5000 series marine grade aluminum alloy. They are cut to the precise size and shape as designed using CNC (Computer Numeric Controlled) plasma cutting tables. After all of the hull components have been CNC cut and formed, they are welded together under tension through our Pre-Flex® Technology process. The hull bottom is set onto our steel jig system which forces the bottom sheet down to the desired degree of dead-rise and holds it there until the boat is completely welded together. - Force the flat aluminum sheet into the exact water controlling shape our engineers designed. - Permanently cause the hull bottom to hold a desired amount of tension increasing the hulls final strength. - Through the introduction of this same tension, Pre-Flex® Technology eliminates the typical hull noise and vibration found in other aluminum boats. The next step is the attachment of the hull sides. Each side is perfectly matched to the now curved hull bottom and tacked into place. The sides are then formed into position creating tension (Pre-Flex® Technology) and welded into place. After a smooth quiet ride in one of our boats you will see why our Pre-Flex technology is what sets us apart from the others. No cross seam sheet joints or welds under our superior boat models. Instead you will find a full one-piece bottom from front to back and side to side in all our outboard & jet models. This gives a true running surface without unnecessary seams. The Delta pad bottom is quick to plane, with or without high payloads. The advanced bottom design is formed right into the hull (adding tremendous strength and performance) it is not welded in later. Running right up to the bow stem of the boat this feature allows the boat to rise up level ride on this surface for an out of the water plane. This along with the boat's light aluminum weight gives you extremely good fuel economy and performance that impresses even the most experienced boaters. Our delta pad bottom is formed at a very efficient 8* degree angle of attack to the water direction of plane. 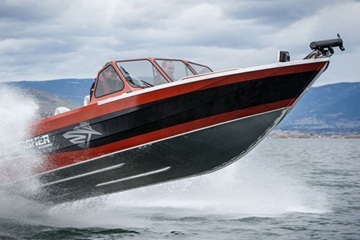 This angle is perfect for the optimum performance of the boat at all speeds. Our one piece bottoms with formed in pads are designed for use with todays heavier 4 stroke outboards ensuring proper boat performance.